Jupiter Urban Wildlife Centre is a great place for family adventures. Try your hand at pond dipping, minibeast hunting, den building or a whole host of other free activities. 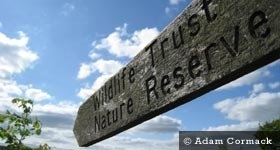 Open all year and run by the Scottish Wildlife Trust. Jupiter Urban Wildlife Centre is a green oasis in the heart of Grangemouth. Managed by the Scottish Wildlife Trust, Jupiter is an excellent example of how ex-industrial wasteland canbe transformed in to a thriving habitat for wildlife. Come and explore for yourself by trying out some of the many free activities on offer - try your hand at pond dipping, minibeats hunting, bird watching or build a shelter in the woods. Make a day of it by having a picnic or borrowing our barbecue! There's also a year round programme of Ranger led events - contact us directly for more information. Jupiter is located just off Wood Street in Grangemouth. From the M9, take junction 5 if coming from Edinburgh or junction 6 from Stirling. Follow the brown VisitScotland signs that start once you're off the motorway. From either direction, they'll lead you to Beancross Road. From here, turn on to Newlands Road then left on to Newhouse Road. At the mini round about, take the first exit on to Wood Street then look out for the entrance to Jupiter on your right. The closest train stations to Jupiter are Falkirk Grahamston and Falkirk High. From here, the 3, 4 and 4A bus services regularly head to Grangemouth. The nearest bus stop to Jupiter is on Beancross Road, just opposite Newlands garage. This is approximately a 10 minute walk from Jupiter.